With the chill of October days here in the Northern Hemisphere, it’s time to bring out some of the warmth fabric quilts offer! That inspired me to post a couple of card fronts I created after attending the Sunbonnet Sue Quilt Show in Sequim, Washington, in 2007. 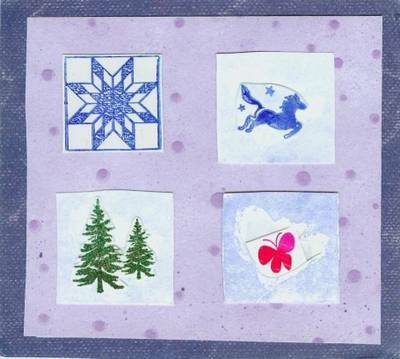 The “quilts” use a combination of rubber stamps, inks and paper, and a little hand-lettering. Stamps: A portion of the Posh Ponies stamp; Hero Arts Poppy Blossom; “Dream” by Stampotique; Happy Birthday by All Night Media. Cardstock scraps, purple stripe, blue & light brown; white cardstock. Royal Blue VersaColor ink; and an Olive Brown Marvy Marker. Images were stamped on paper, then adhered starting with the purple striped paper. Poppy blossom stamped on white cardstock four times in different positions is attached to the purple striped paper. Horses from the Posh ponies stamp were cut out and attached with a glue dot to the VersaMark ink cube image. “Dream” was stamped in olive brown on light brown paper. 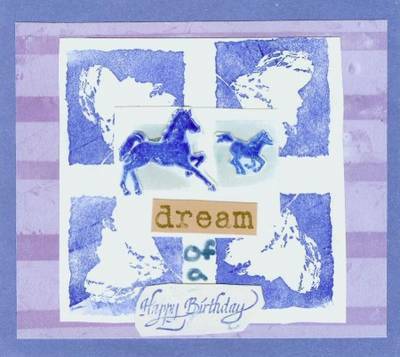 “Dream of a Happy Birthday” combines stamping and hand-printed letters. 2. Butterfly, in red and pink inks, attached to Poppy Blossom, which was stamped in royal blue with progressively lighter images. The flower in the image was removed before the butterfly was attached. All images stamped on glossy cardstock scraps, attached to the purple dotted paper, which was adhered to the denim-style paper. Looking for information about rubber stamping? Look in your favorite bookstore for the RubberStampMadness magazine, or visit their website at http://www.rsmadness.com. My favorite websites also include http://www.heroarts.com and http://www.clubposh.com.